Thanks to some helpful folks in the Facebook forum “What’s this bird,” I learned that this little duck-like bird that I spotted on Monday morning at Occoquan Bay National Wildlife Refuge is a Horned Grebe (Podiceps auritus). 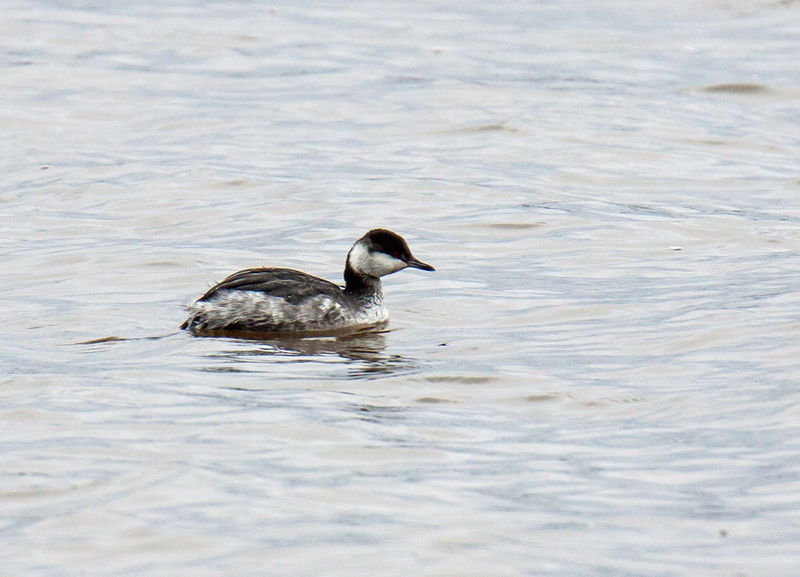 I have seen several other kinds of grebes before, but this was a first-time sighting of this particular species. When I looked at the Cornell Lab of Ornithology page for this species, I was a little shocked to see how different this bird looks when in breeding plumage. 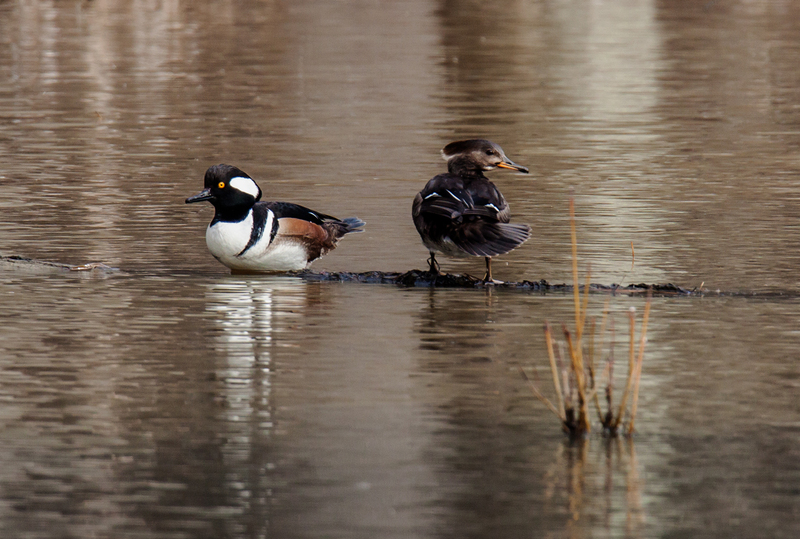 “Breeding adults have black heads with rich golden tufts, black back, and cinnamon neck, breast, and sides.” Wow! That would be quite a sight to see, but, alas, it looks like Horned Grebes do not breed in my area and are only visitors here for the winter. 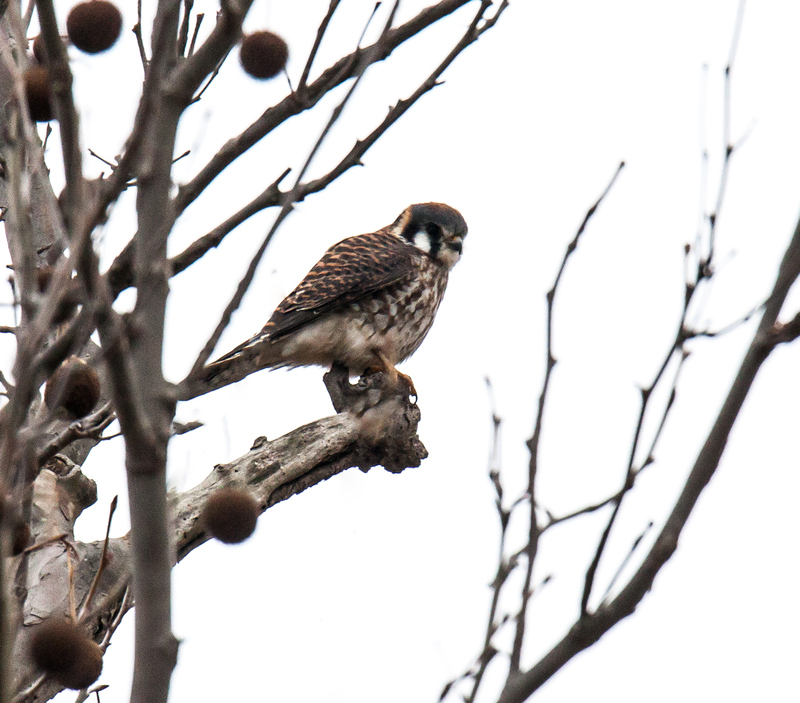 Yesterday morning I was thrilled to see this American Kestrel (Falco sparverius) at Occoquan Bay National Wildlife Refuge. I had never before seen this little falcon, but its coloration and markings are awfully distinctive, so I had a pretty good idea what it was. I was really struck by the small size of this bird, as compared with the Bald Eagles and vultures that I had seen earlier in the day. According to the Cornell Lab of Ornithology, the American Kestrel is about the size and shape of a mourning dove and is the smallest falcon in North America. As you can tell from the background, it was heavily overcast when I took this shot, so the colors do not pop as much as they would in bright sunlight. One of my viewers on Facebook also noted that this is a female and, as is the case with most bird species, the colors of a female American Kestrel are more muted than those of her male counterpart. I remember well the location of the tree in which the kestrel was perched, so I will add that location to my already long list of places to check when I visit this wildlife refuge, which has proven to have a pretty amazing variety of species to observe. 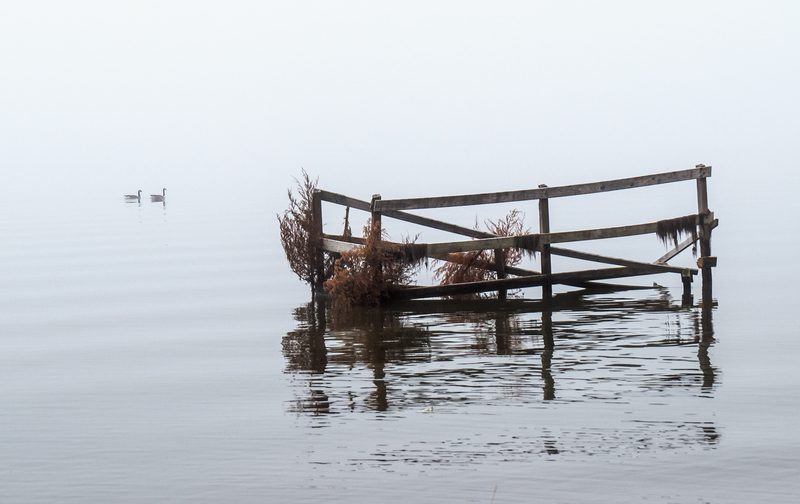 What kind of bird would be a perfect match for a gloomy, fog-filled day? 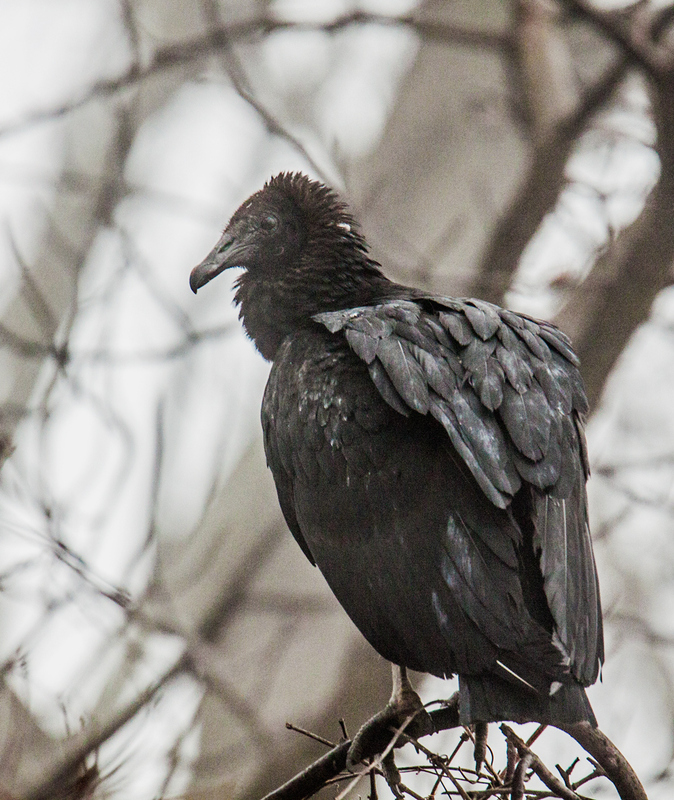 I might suggest that this Black Vulture (Coragyps atratus) that I spotted this past weekend at Occoquan Bay National Wildlife Refuge would fit the bill admirably. 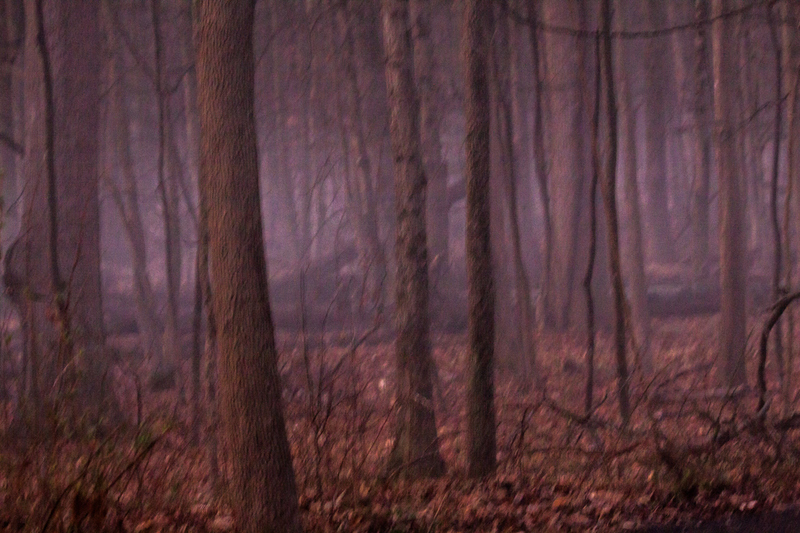 There was something shadowy, mysterious, and a little creepy about this large dark bird as it perched low in a tree and looked right at me through the fog. I felt a little shiver as I looked up at the vulture, but maybe it was just reaction to the cool temperature. The light was dim in the early morning hours this past Wednesday at Huntley Meadows Park, but I could detect some movement in the vegetation adjacent to the boardwalk that runs through the marshland. 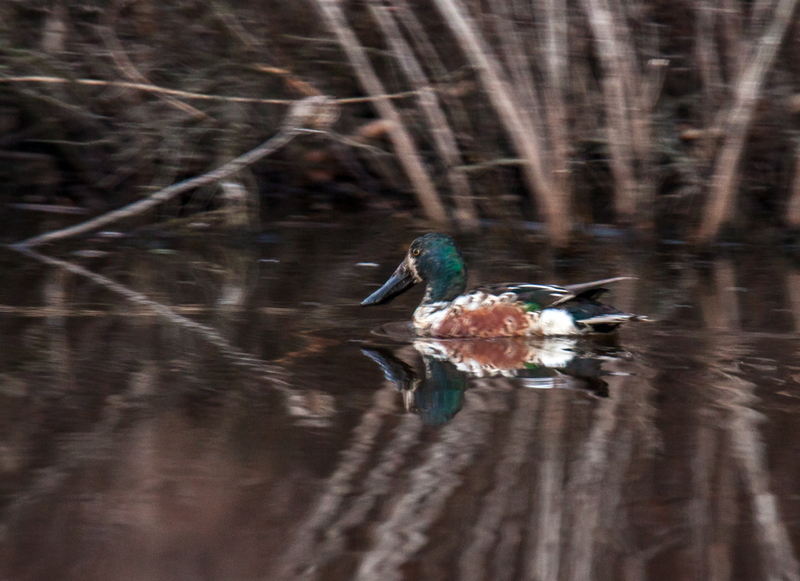 I watched and waited and eventually a male Northern Shoveler (Spatula clypeata) swam slowly into view and I managed to capture some images of it. I love the reflections of both the duck and the vegetation in this shot. 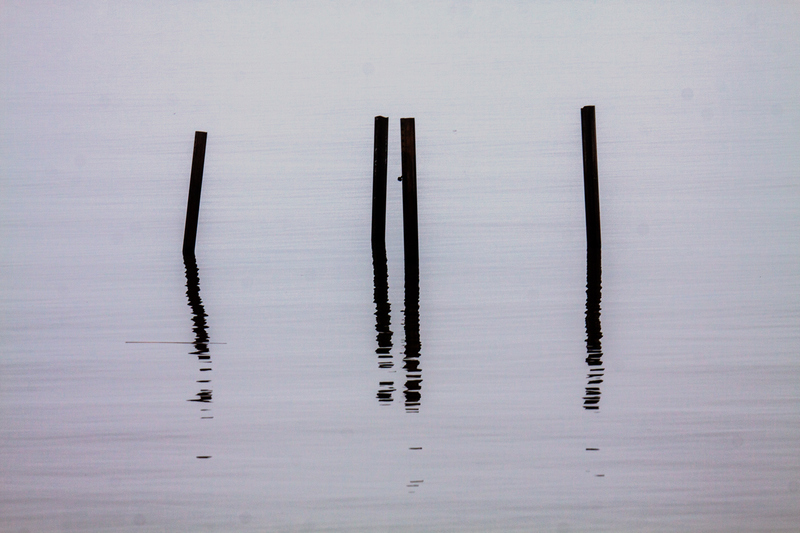 After the fact, I discovered that I probably should have changed the setting of my camera to raise the shutter speed. Many of my shots were blurry, but somehow this one came out reasonably sharp, despite the fact that it was taken with a shutter speed of only 1/15 of a second with my lens zoomed out all of the way to 600mm. I am pretty sure that it helped that I was using a monopod. 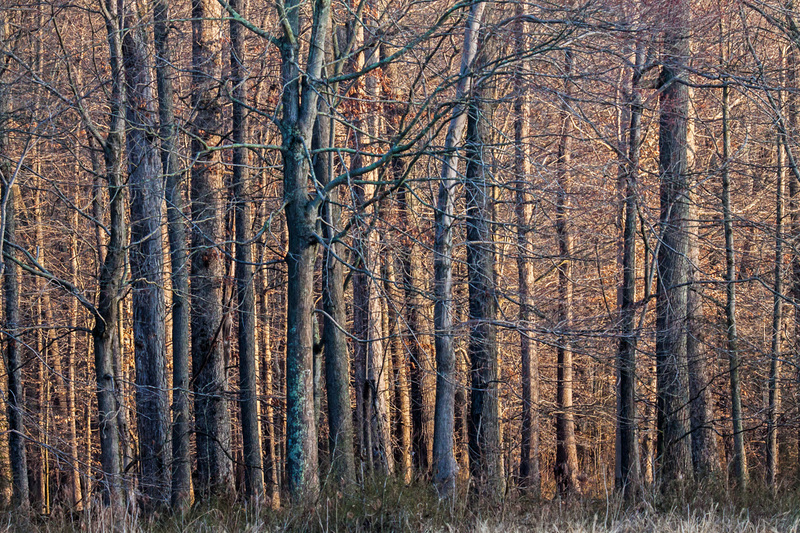 This incident reminded me of the special challenges and rewards that come with shooting at dawn or dusk. There is often a lot of activity, but there is a constant struggle to capture that activity in the limited light that is available. When things come together, though, it is almost magical and is definitely worth the effort.